Starting in the late 1990s, cars with retro styling cues have become big sellers in the US. The retro car trend did not originate in America, however. PT Cruisers, Prowlers, SSRs, HHRs, Crossfires, VW Beetles, Fiat 500s, Mustangs, Camaros and Minis all owe something to this early pioneer of the nostalgic aesthetic movement. 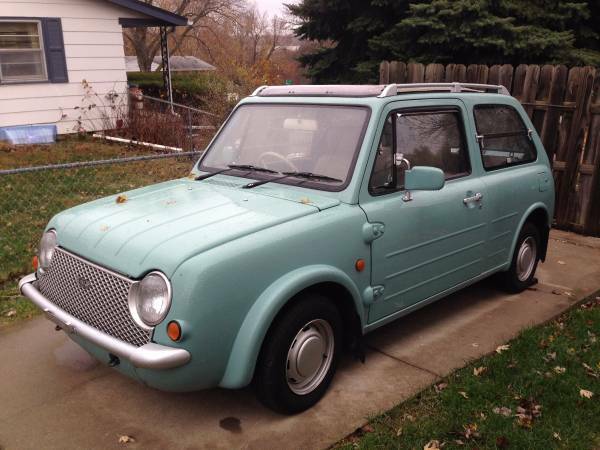 Find this 1990 Nissan Pao for sale in Omaha, NE for $5,500 via craigslist. 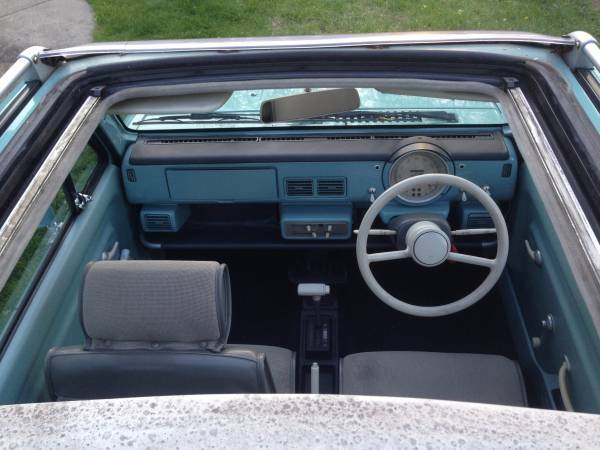 You can find elements of this Pao in a lot of cars that came much later. The single round Gauge? Mini Cooper. Mesh grill? Jag S-Type. 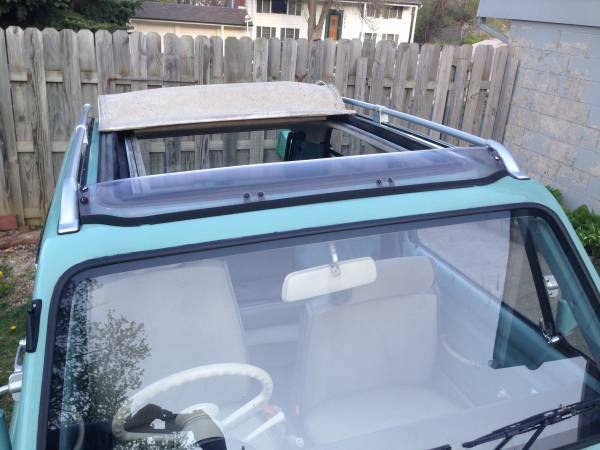 Jumbo roll-back sunroof? Fiat 500. Corrugated body panels? Chrysler Crossfire. Round headlights were uncommon in 1990, but became the trademark of the ubiquitous Neon released 3 years later. This car was less compromising with its throwback design than later retro-inspired cars. Note the thin bumpers and steering wheel, boxy dash, external hinges and simple steelies. The spartan round gauge and ornate control levers were much truer to 50s & 60s pieces than those found in American retro cars from the late 90's onward. Details like very basic seats, door handles and other hardware treated the driver to a nostalgic tactile experience, as well. Even the car's 1,600 lb. weight and pastel color contributed to the theme of this car. Nissan was years ahead of its time with the Pao and its impact can still be seen today. Not only does this car represent the start of a styling trend, but you could argue that it did retro better than its domestic followers. We are happy that we are finally able to own these gems state-side and satisfy our nostalgia for the nostalgic. Dang, why does this have to be an Automatic? Cool and dull vs Cool and fun. And how does something like this end up in Omaha NE? I mean, I had family from around there, but still...someone USAF who fell in love with one in Japan? He couldn't have just done the sane thing and brought a girl back, no, he had to have a little Nissan? These have the drive train from the Nissan Micra of the time. According to Wiki, they were available with the 5-speed manual, so maybe this particular example could be retro-fitted (get it, RETRO fitted, huh, huh!). In any event, it would be an entirely usable car (even if the SUV crowd would never realize that fact). 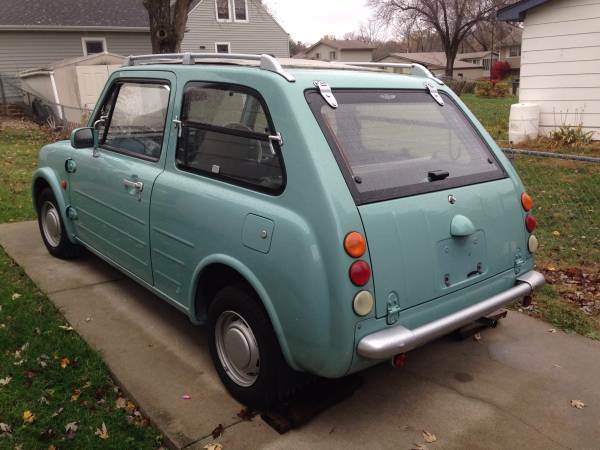 I just returned from a 240 mile one-day round trip in my 600cc 2CV, so this Pao looks like a luxo-cruiser to me. Classic beauties are rare gems that not just anybody would have the luck to uncover. It takes constant searching on a regular basis to finally settle down with the rarest masterpiece. Some oldies do not have the best exterior design I must say, but it is the unique outlook that is so attractive in my opinion.